Whether you love Valentine’s Day or hate it, it is always fun to have loved ones over for brunch. For Valentine’s Day this year, I opted for a festive brunch. You can celebrate Galentine’s Day with your girlfriends or scale this back for a brunch party for two on Valentine’s Day weekend. Valentine’s Day is the last holiday for our peppermint mocha cream until the holidays roll back around and a brunch felt like a proper send off for one of our most beloved flavors. 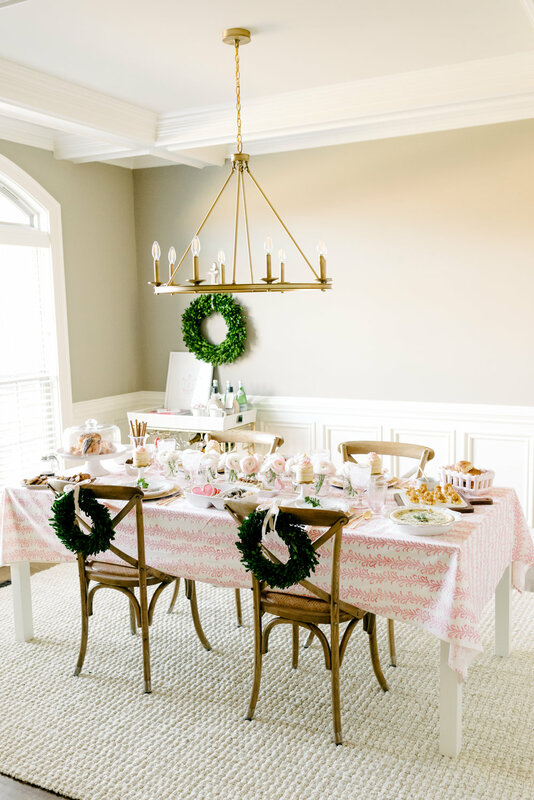 I wanted a softer feel than traditional red and white colors for this brunch party. I opted for blush and white with pops of red. The boxwood wreaths added a fresh pop of green to the soirée and were a Target find. The invitation from Dixie Designs inspired the tablescape. I love using real invitations, it adds a nice touch to a party. I used the gift tags from the paper suite for Jackson Morgan mini bottles for the party favors. Since the India Armory tablecloth was a print, I kept the centerpiece simple with mini mason jars filled with stunning ranunculus flowers in blush pink. 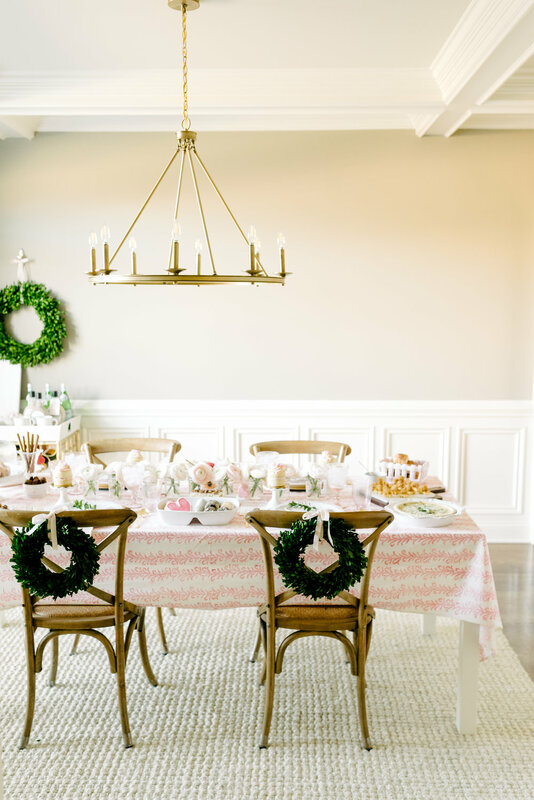 I tied mini boxwood wreaths to the chairs with blush velvet ribbon to match the larger wreath over the bar cart. The heart appetizer plates from Juliska were one of my favorite details. I used mini cake stands to display individual cakes next to each place setting. I kept with a traditional bunch menu. Apple hand pies with pink icing (an adult pop tart), spinach quiche, fried chicken and waffles, fresh fruit, spiked Jackson Morgan salted caramel pancakes (recipe coming soon), heart sugar cookies, mini pink layer cakes, biscotti, assorted croissants, Jackson Morgan spiked Drunken Donuts, cinnamon rolls (topped with red and pink sprinkles), and biscuits with maple pecan butter. All images Christy Wilson Photography, you can shop this post below. Special thanks to Juliska, Nora Fleming, and Drunken Donuts for partnering with us on this party.